Our company has over 80 office locations in more than 30 countries. For new buildings or renovation work, we apply a number of principles, one of which is sustainability. In 2017, we completed Swiss Re Next, our new office building at the Group’s headquarters in Zurich. Right from the start of the project in 2009, sustainability was defined as a key topic and subsequently integrated into its planning, construction and operation, as well as the demolition of the former Neubau building. Two spacious atria and the glass facade bring daylight into the building and thus greatly reduce power consumption. A solar plant on the roof delivers 5–7% of our power consumption for the building. For the rest we buy certified “naturemade star” electricity from renewable sources. The innovative ceiling heats, cools and ventilates the building, thus creating a pleasant office climate with good acoustics. Heat pumps using water from nearby Lake Zurich heat and cool the building. Wherever possible, we have used recyclable materials, including more than 50% of the concrete. The building meets the tough standards of both the MINERGIE-P-ECO® and LEED Platinum certificates. Peripheral steel columns at maximum distance allow for open internal spaces, providing optimal flexibility for our interactive workplace concept. Together, these and further measures help reduce energy consumption at Swiss Re Next by 60% compared with the previous building, and by 80% per workspace. The lakeside facade of Swiss Re Next, our newly completed headquarter building in Zurich. Right from the project’s start in 2009, sustainability has been embedded in its planning, design and performance. 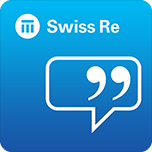 Hear what they are saying: Download the Talking Walls app from the App Store or Google Play and discover bite-sized stories about Swiss Re Next, its sustainability features, workplace concept and artworks.